ALL THE TIME GOD IS GOOD! : Great Grace: What About the Confession of Sin? We've been in an ongoing study detailing the great Grace of Almighty God. We have seen His Grace is greater than our failures. His great Grace has freed us from the observance of Old Covenant rituals and brings us out of performance rooted religion and has forever forgiven us of our sin. Today, I want to continue looking at our forever forgiveness in Christ. Now you may be saying, brother, we have heard all this from you before. We read about His Grace, our forgiveness in Christ, our righteousness, and our eternally secure salvation constantly on your posts. Got anything new? Let God's Word respond to this objection. We must consistently feed on the truth of God's Grace and His work in our lives less at anytime we lose sight of Grace and revert back to self-efforts and performance. That is why we share these marvelous truths of our perfect redemption Grace purchased for us. In our last study, we began detailing our forgiveness in Him. We also looked at the religious checklist that men created to deal with personal sin. To sum it up, it is basically when we sin, there is a penalty or punishment coming to us. God can't fellowship with us until we repent, (defined as to turn around, to cease the action), and confess the sin. Now, this "punishment" differs depending upon what denominational background you have. Usually, it centers around God not answering your prayers. Or that you're temporarily unable to access a portion of His favor or receive any blessing in your life. In Charismatic/Faith circles it could mean God won't bring you financial prosperity or you won't receive your healing. We shouldn't let religion dishonor and discount the once for all perfect sacrifice Christ paid for our sins by accepting some man-made guilt concept where we also must pay for our sins. Holding to a concept where we must also receive some form of punishment for our sins is, in reality, saying God isn't satisfied with Christ's once for all sacrifice for sins. Confession of sin, is it for the Believer? Now that we addressed the "punishment" aspect of sin, let's address the confession of sin. What about the confession of sins in order to be forgiven of sin? Is it His blood or our apologies that bring forgiveness? Imagine if you will, a newly converted believer living in an oppressive nation where Christianity is outlawed. Imagine a nation known for persecuting Christians. Now, what if this new believer were only given sections, one at a time of the New Testament? Over the period of let's say a year, he received the four gospels, Acts, all of Paul's Epistles to include the Book of Hebrews, Peter's two Epistles, and James and Jude. He had not yet received John's Epistle or the Book of Revelation. Would this new believer then find a passage instructing him to confess his sins in order to receive forgiveness? The answer is a resounding no! This makes the hairs on the back of our necks stand up. We get a sense of astonishment and then a strong sense of concern. This is borderline heresy in most circles. This is downright blasphemy to some. Confession of sins is a practice we see in the Old Covenant. See here and here and here. Yet these confessions weren't what brought forgiveness, it was the sacrifices they had offered to the Priests. In essence, what we see occurring in these instances were people simply acknowledging their misdeeds, and failures, and sins. It is the same in this New Covenant. It isn't our apologies that bring forgiveness it is only perfect shed blood that purchases forgiveness of sins. So confession of sins, is it for the Believer? That depends on your understanding of confession of sin. 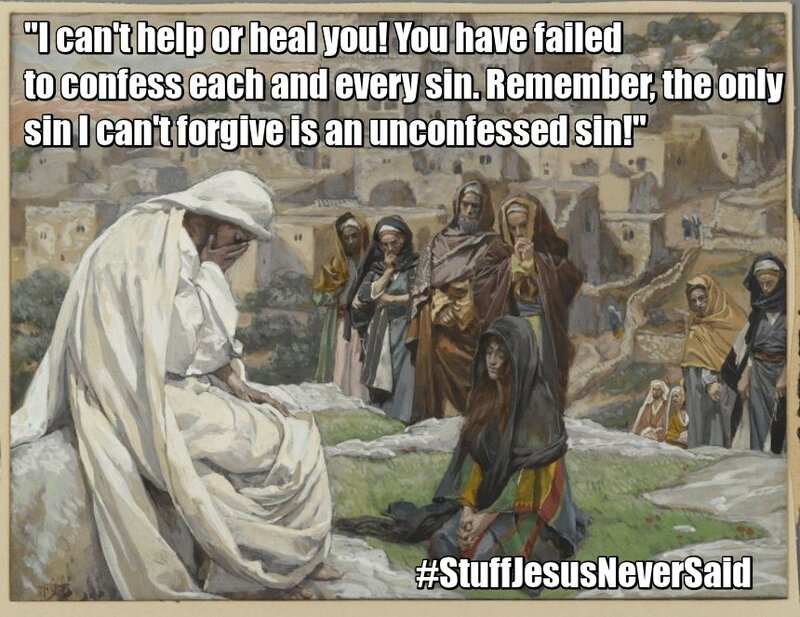 Do we confess our sins in order to receive forgiveness? No, this confession is not for the Believer. However, if you define confession of sins in the sense of acknowledging our failure or misdeeds, and simply agreeing with what God said about them then that is acceptable for the Believer. Heresy, false teaching! Some may be crying out. Hold it now. What did Paul say that confirmed Jesus' own words? He said in the mouth of two or three witnesses will something be established, here. Now in this New Covenant can you find two or three places where the Word instructs us to confess our sins, in order to receive forgiveness of our sins? The answer is a resounding no. The problem is we have this stronghold in our minds involving 1 John 1:9. It is not that the Word is wrong and is a stronghold but the religious misapplication of this passage is. John was teaching the Church about the Gnostics that had infiltrated the Church and denied that sin existed. If sin doesn't exist then what need is there for a Savior? John is evangelically speaking here and telling them to acknowledge their sin and agree with what God says about their deeds (they were indeed sinful) and that He offers once for all forgiveness through Jesus shed blood. Yet religious tradition resists this interpretation. They insist this passage is for the Christian just in case they sin after conversion. You see what the results of denying and discounting future sins being forgiven are? Before salvation, all your sins were dealt with by the Blood of Jesus at Calvary. 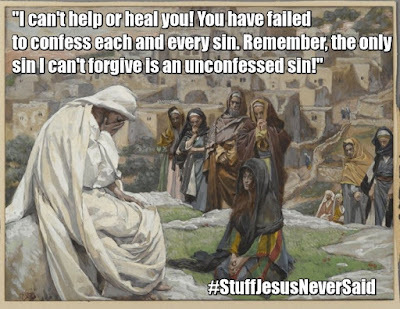 After conversion, the forgiveness of your sins are left up to you to ensure you confess each and every one of them or you will find yourself having unforgiven sin on your "spiritual account". There is a major concern this type of teaching seemingly ignores. It goes back to their man-made checklist. They redefined the punishment for sin. Recall, it was unanswered prayer, and God breaking fellowship with you. Problem is that is man's definition of the punishment of sin. It isn't God's. The wages of sin is one thing and one thing only. Spiritual death. This means if our future sins aren't already forgiven by the shed blood, then when we sin we must then be partaking of spiritual death over and over again until we confess our sins. What if we forget to confess? Well, don't fret religion created a loophole. They say well the Blood covers you until you confess it. So wait, is the sin forgiven or not? Oh, it is just covered? Wait, isn't that how God dealt with sin in the Old? What this proves is tradition lacks serious understanding of the New Covenant. They go through these mental gymnastics and blending portions of the Old and New together in order to combat what they see as a concept that gives people a "license to sin". If future sins are already forgiven and there is no need to confess in order to receive forgiveness then what is stopping us from pursuing lust? So they created this concoction of Old and New Covenant style redemption. Where we are forgiven in installments. Where after conversion, God's method of forgiveness shifts away from the once for all sacrifice of Jesus perfect shed blood to our up to date apologies. What some religious folk fails to grasp is that the use of 1 John 1:9 has become a ritualistic "bar of soap", for some cleaning them up when we fail. This can become a "license" for some. Some in religious circles realize this. This is when it gets real harsh. They begin espousing teachings that even if you confess your sins it is potentially possible that forgiveness will allude you because you may not be sincerely remorseful. Or they say you may be sinning the same sin once too often. Confessing that sin you habitually engage in, runs the risk of you breaking the "Grace limit" and thus God choosing not to forgive you. Some religious leaders set themselves up as God's spiritual accountants doling out His forgiveness as they seem fit. Often times this forgiveness is withheld because the sincerity of your sorrow, regret, and penitent attitude for your sin comes into question. They will finally bestow this forgiveness upon a believer when in their eyes they have satisfactorily shown sincere regret and remorsefulness for their sins and transgression. When we realize we are forever forgiven we can walk with God our Father, honoring the great and wonderful sacrifice of Jesus. We honor and revere that precious shed blood. It isn't our apologies, our commitments to fulfill spiritual disciplines or our promises to do better in the future that bring us righteousness, forgiveness and eternal redemption. It is only His precious shed blood. Thanks so much for those super ncoursging words. Having been raised Catholic, it's almost too good to be true! That is the litmus test for the gospel. Too good to be true but true good news. Amen.